Today is Blue Monday and it’s easy to see why – it’s cold, it’s dark, Christmas seems a long time ago, and chances are you’ve had to fight through the bad weather to get into work when really you’d rather be able to crack on with a cup of tea from the safety of your own home – sadly ‘snow day’ doesn’t carry the same excitement as it did when you were a kid, amirite? Well fret not – FASTdesk could be the answer to your prayers, and the perfect way to do something positive on the worst day of the year! Every morning in British winter is a Russian roulette – you wake up in the pitch black, drag yourself out into the cold, peer fearfully outside the curtain to see if you can make out the snowdrifts that always seem to catch us by surprise… let’s face it, it’s hard enough facing going into work without the added threat of bad weather – ‘Thundersnow’ anyone?? During some of the worst snow falls in recent years, the Centre for Economic and Business Research said that 20% of the population had zero productivity per day which equates to around £1.2bn, which means businesses need continuity arrangements in place – businesses with a business continuity plan in place gain a competitive edge. So, if you’re an employee that’s worried about the extra hours added onto your journey in inclement weather, or even making it in safely at all, but worry that you’ll let the team down or even get your pay docked if you can’t get into work, the Government websites suggest trying to come to an arrangement with your employer that you are both happy with. Having a secure, intuitive platform available to your team that allows you to work from anywhere as if you were in the office, could be the Christmas miracle that came late this year then! We recently launched a brand new service called FASTdesk, a Desktop as a Service (DaaS) solution that allows organisations to run user desktops as a virtual machine from a centralised server. What this means is that your company can provide access on any device to a fully personalised desktop for a group of, or all, employees within an organisation, leading to increased flexibility, improved security and agility. It’s great for BYOD (Bring Your Own Device – companies that have employees using their own devices for work purposes on the go), data protection and generally making IT admin much easier. This means that you can have peace of mind that while it’s winter outside, it’s still summer for your business; and will probably make everyone’s lives a bit easier too! 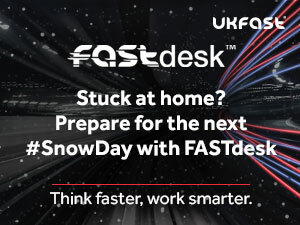 Don’t get caught out – weather the storm with FASTdesk!